Heller covers the basics. He does so in a rather quirky way with very short, self-contained chapters. On the one hand, the book presumes one can read notes and there are many musical illustrations. On the other hand, he has some basic music hints –such as an illustration on how to relate notes on the score to a picture of a piano, or what a major and minor chord sound like –examples which makes the book seem as if it’s intended for those who have a very hard time reading music and no music theory background at all. It does seem difficult to me to explain Jewish modal theory if one doesn’t have the basics of a western scale firmly mastered. Somehow I’m having a hard time understanding this book’s audience as the author envisioned it. Is it a book that is aware of a reader who needs to know where middle C is, (as on page 15), or is it geared to someone who will be following the musical examples that feature Mussorgsky’s 64th triplet in grave energico on page 111? Heller has many footnotes, but these are not numbered. They appear at the end of chapter with the keyword he had in mind emboldened. The footnotes run in to each other on the same lines and it’s hard to go back and forth and find the exact place he’s talking about. Well, actually, they’re not all exactly ‘footnotes’ –since there’s nothing really stating that the ideas are from a particular place for each listing, although some do give a reference. Many of these are more like “extra musings” or maybe some explanations about what the text may have tried to convey. 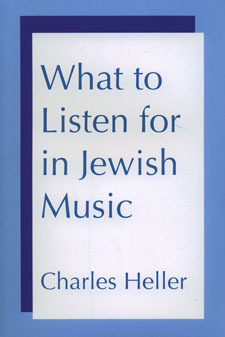 After another one-page chapter entited “Three definitions of Jewish Music”, Heller includes an in-depth chapter of all of 4 pages on the history of, and role of, women in Jewish music. Interestingly in this chapter on women the only two modern women mentioned are Debbie Friedman and Linda Hirschorn. For more information on them, we are referred to the chapter on “Nusah in the Twenty-First Century”. Given that Debbie Friedman is not known for her use of nusach in compositions in her first 25 or so years of writing Jewish music, I thought this was an extremely interesting placement of her within the context of Jewish music. (Sort of, the “uncontext.”) On the other hand, so far Heller is the only one I know who has taken the time to actually label a specific chapter on women in a general book about Jewish music (other than Marsha Edelman who devotes a subchapter to women in her book Discovering Jewish Music, and of course, Kay Shelemay on Let Jasmine Rain Down). The author claims to base his book on original research, but I’m not sure exactly where that is, although he apparently did a lot of interviewing of many prominent specialists in the field. What Heller states is often not so problematic as the jarring nature of reading the text. For example, in the chapter on “Some Special Modes” he’s explaining the Romanian “vollekh.” Suddenly, we have 2 small biographical sketches of people who came from Bessarabia, and then something about comparing Zek, Transylvania with New Orleans as a tourist spot. It may not be inaccurate, but where did this come from? It’s just a jarring out-of-context moment, that is one of many such out-of-contect moments that makes reading the book rather, (er…), one can just say that personality is not missing from the pages of this book. According to the preface, the book is organized by “pattern” and “process” instead of historical periods. This is good, because people don’t listen to music based on historical periods, but rather what they are hearing. True. The book traces “melodic patterns which recur in Jewish music”. The need for this is evident. The explanations are kept short and distill the essence of what is necessary to know. That’s also good. (It’s always good to try to get people to listen to what they are hearing, I say.) One should try to put music into a musical context, (indubitably so)…so that the listener understands the music itself as part of a greater pattern. Heller is answering a need that needs to be filled. He has written a book that may appeal to beginners, (‘laypeople’), which is to say, (in his world), not too complex musically (or too complex if you can’t read the music, but who’s asking here?) He keeps the writing per subject short and issue-specific. This is a book that attempts to bring the non-musicologist into the world of Jewish music. There is a need for such a generalist book. One is reminded of the books we’ve used in the general music world on ‘how to listen to music’ by such eminent commentators as Karl Haas or Robert Sherman. This book, however, doesn’t quite fit the shoes of its own expectations. For entry level students and ‘laypeople’, one can still recommend Marsha Edelman’s Discovering Jewish Music over Heller, and her book has a CD where the reader can also be a listener.